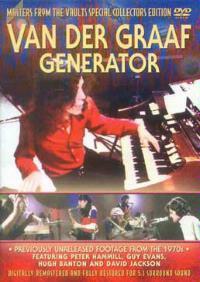 One of the most underrated of the 70's prog-rock acts, this Van Der Graaf Generator TV appearance (looking to possibly be from French or Belgium TV) demonstrates the incredible chemistry that these guys had. Filmed in 1971, this release captures the band with Peter Hammill on vocals and keyboards; Guy Evans showing the audience what a real drummer should be; Hugh Banton creating extra texture and organ sounds under Mr. Hammill and David Jackson on two saxes. The band are set-up in a TV studio and play extremely well together. Pieces include Theme One and A Plague of Lighthouse Keepers (including it's sub-headed themes). Camera angles are exactly what one would hope, showing many close-ups of Guy Evans playing his rolls, Hugh Banton changing organ sounds and Jackson playing both saxophones at once. Peter Hammill's hands aren't shown much but close angles of his contorted face are. Theme One includes a great little hook that has a 'where have I heard that before' quality and includes interaction between the players unparalleled by many other artists of the era. It is such a pity that bands like Pink Floyd. who (excepting Gilmour) were not stand-out musicians, had greater commercial success than VDGG, however I suppose that it is the nature of acts like this and others from the late 60's and early 70's who seemed more in it for the music. Plague… is at times violent, yet also subtly subdued and dreamy. This piece takes the listener on a journey in which the cameramen and film editors really identify with each other. It is hip and exciting then turns to a confrontational nightmare, before rounding off some tasty electric piano work. This could best be described similarly to recent work by Radiohead, yet more organic and truer to itself. Remember, it's about the music - I love VDGG, I don't love (- more realistically really, really dislike) Radiohead. At one point we see the barefooted Hammill trashing his piano revealing that he is reading lyrics from an album cover! There is a living, breathing improvisational quality about this band and their performances. There is an art rock quality about what they do, but they tend to be on the far end of the scale away from the 'pomp' of bands like ELP, or Yes. They are great musicians and deserve better recognition, and I would hope that more people will re-discover them. The DVD ends with a weird synth note, akin to white noise, instead of an outro theme song over credits. Truly unique compared to today's contrived and often mimed TV musical performances and an incredible document from the VDGG time capsule. Although the performance is only 30 minutes long, this is by far the best of the DVDs I have seen from the Rock Legends (or related) series.